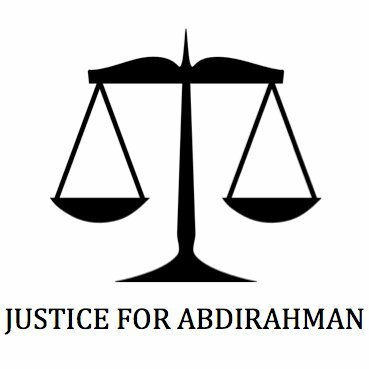 (Ottawa ON – March 29, 2017) The Justice for Abdirahman Coalition (Coalition) is expressing outrage and disappointment concerning the solidarity campaign by members of the Ottawa police service to wear wristbands in support of the officer charged with manslaughter. On March 6, 2017, the Special Investigations Unit (SIU) concluded that Const. Daniel Montsion was allegedly responsible for the brutal killing of Abdirahman Abdi. Today marks the first step towards justice for Abdirahman after the community and family waited patiently for the SIU to complete its investigation, and the launch of a bracelet campaign is a direct insult to those of us who stand against police brutality. What’s more is the insult and total disregard to the suffering of the Abdi family who are still grieving the loss of their family member. The alleged vile actions of this officer have traumatized this city. This particular act of solidarity demonstrates a blatant disregard for human life. “This is not a traffic violation we are dealing with, this is an alleged cold-blooded killing of a civilian by an officer on the sunshine list” said the Chair of the Coalition. Comments made Wednesday morning by Ottawa Police Association president Matt Skof are extremely short sighted and very shocking. In an interview he stated that the campaign had nothing to do with community relations and that the bracelet simply expresses support for a fellow colleague in ‘difficult profession going through a very difficult time’. “No one is contesting that policing is difficult. We honour and respect the hard work and sacrifice of those who serve and protect with dignity. The problem is with people like Matt Skof and other members who choose to wear these bracelets that tarnish the integrity of the police service”, added Ahmed. Charges of manslaughter, aggravated assault and assault with a weapon are serious allegations and nothing to be celebrated or supported. “Imagine if the tables were turned and there was a fundraiser or support campaign for a civilian who the crown alleges brutalized and murdered an officer, there would be outrage” said William Felepchuk, member of the Coalition. Aside from the indifference to the pain and suffering the incident with Montsion caused, this campaign is not only in bad taste it shows horrible leadership, bad judgement and it begs the question: what sort of precedent does this bracelet campaign set in cases of cold blooded murders? We, as concerned citizens, are deeply disturbed by this campaign and urge all officers and members of the Ottawa community to not partake in wearing these bracelets. It is difficult to stomach the idea that 1200 bracelets were purchased to show support for an individual charged with manslaughter — police officer or not. We stand by the fundamental principle of the rule of law and, as such, reject the double standards accorded to Const. Daniel Montsion through this campaign. We call on the members of the Ottawa Police to show reason and discretion in this difficult time and to act with human dignity in mind. As we have said many times during this entire ordeal, the problem with the Ottawa police is the actions of few going unchecked by the organization. It is high time for this narrative to change. As such, we also call on the Ottawa Police Board to stand up and take a concrete stance by issuing a directive to block these bracelets from being worn by any member of the police service during active duty. The Justice for Abdirahman (JFA) Coalition (“the Coalition”) is a group formed within days of Mr. Abdi’s death. The Coalition is based in Ottawa and supported by local and national advocacy groups. The Coalition’s objectives are to obtain greater transparency, challenge racial inequity, increase support for mental health needs and bring positive change to our law enforcement institutions. The Coalition asserts that fairness, transparency and accountability in our law enforcement institutions are critical to ensuring all of our safety and security. We can now see how much the Ottawa Police value our citizens. Deplorable! How can we be expected to trust a Police Service like this? Shame on them. And I hope that Chief Bordeleau takes action to get RID of these wrist bands. The Ottawa Police are paid for by our tax dollars. ENOUGH said! I am truly ashamed and disgusted with the Ottawa Police Union, Matt Skof for allowing this derogatory behaviour and supporting the solidarity campaign by the Ottawa Police. Mr. Abdi`s death was an unnecessary, cruel show of force by the officer charged with manslaughter. Instead of showing solidarity for the police officer the solidarity needs to be for Mr. Abdi`s family who deserve justice for witnessing there family member being beaten to death in front of them by someone who took an oath to serve and protect the citizens of this community. Shame on the Ottawa Police, the Ottawa Police Union, and Matt Skof, and also the Mayor Jim Watson for not speaking out against the solidarity campaign. A petition needs to be started and circulated to show our united voices and to stand in solidarity for Mr. Abdi and his family and our communities!! Hello ? Dangerous Dan has such severe anger management issues that he beat an unarmed, disabled man to death AFTER he was fully subdued, and all because the Autistic man was fondling a coffee shop patron. Most Ottawa Police are wonderful, but Daniel Montsion is a glaring exception. The only reasonable campaign of support by co-workers is to suggest Montsion is “Not Criminally Responsible” and be sentenced to a mental health treatment facility rather than prison.